There is a toilet in every home; in fact many homes have two or three toilets. Of course about 90 percent of the models found in this country are some variation of white in color, but if you really want a toilet that stands out, there are more exciting color options available. The toilet that you purchase will be an important item that you will have to live with for the next ten or 20 years, so take ten to twenty minutes to read our review to help you find a toilet that has the aesthetics that you want, stays within your budget, and saves water in the process. We have taken the time to look through the flushing toilets that are available on the market to find a few of the best options. Here’s what we have come up with. Our gold pick is a low flow toilet that creates a powerful flush. The Toto Drake II is a two piece commode that is easy to install, but it does weigh about 94 pounds, so don’t try to install it alone. It features double cyclone technology that is combined with traditional gravity assisted flushing techniques to create an effective flush that is both quiet and effective. The bowl has two nozzles that release the water instead of the traditional holes, which adds more pressure to the swirl and helps to clean the bowl as it flushes. This toilet only uses 1.28 gallons of water each time it is flushed, and Toto boasts that this limited amount of water can clean away up to 800 grams of solid waste, which makes this toilet one of the most efficient models that is available today. This toilet is designed to fit an elongated seat, which is not included with this purchase, but any elongated seat will fit this toilet like a glove. The Drake II is designed with a comfort height that meets the standards of the ADA (Americans with Disabilities Act), which means that it is slightly taller than a standard toilet. 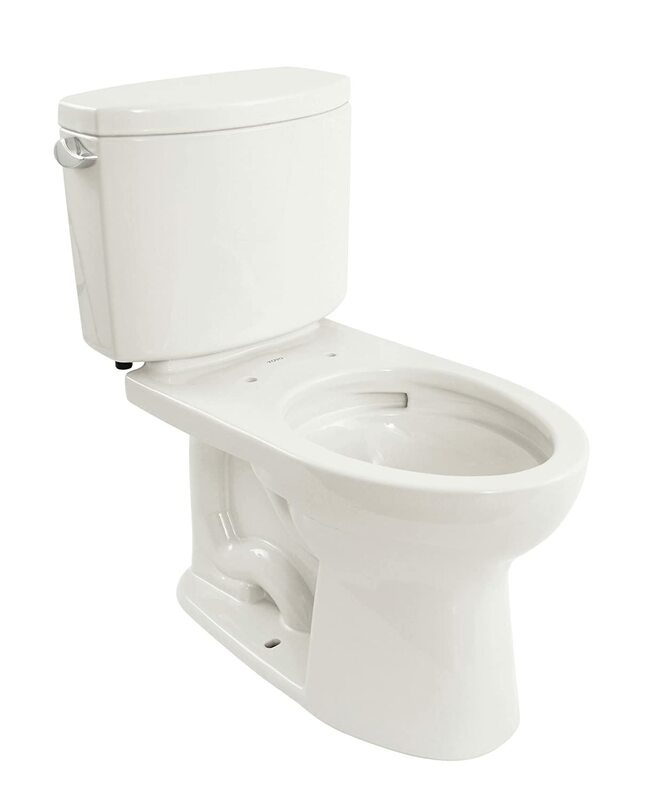 The bowl has a 16 inch height, which makes the toilet about 17.25 inches high when you add the seat. This height is great for taller individuals, but being short may result in your legs dangling, which can be uncomfortable. The ceramic on the toilet is coated with a SanaGloss finish that is designed to help keep bacteria and germs from adhering to the surface of the toilet. This commode is available in bone white, colonial white, cotton white, and sedona beige. In addition, it comes with a one year warranty to cover any issues that may arise in the first 12 months. Insofar as reviews are concerned, 87 percent of the ratings that have been received on Amazon have been of a positive four or five star quality. Many of the customers are impressed with the quality of the cyclone flushing system. It is extremely effective at removing the waste and cleaning the toilet at the same time; in addition, the pressure of the flush is so impressive that having an issue with a toilet paper clog will become a rare issue. Our silver pick comes from American Standard, which is a company that has been providing us with durable essentials for 140 years. They are dedicated to producing kitchen and bathroom fixtures that will last for years as a stylish accessory in your home. Their Cadet toilet is a great two piece model that is easy to set up and install, but it does weigh about 100 pounds, so make sure to have assistance if you decide to try self installation. It features an elongated bowl to add comfort to your backside. 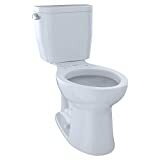 The rim is designed at a height of 16.5 inches, which is a few inches taller than a standard toilet. It complies with all ADA standards, so it is the perfect option for individuals with disabilities or someone who is elderly that may have difficulties moving around. This commode utilizes a pressure assist flushing system that is designed to quickly and efficiently flush away the waste that you create. It features a powerful siphon jet that blasts the water into the bowl and down the drain. 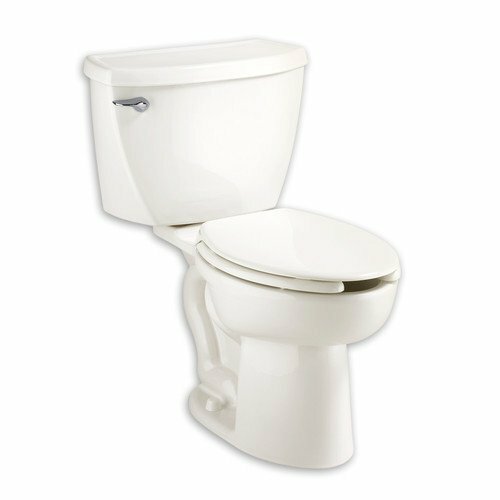 A flush only uses 1.6 gallons of water, so it is a water efficient choice that is not a good as some options, but it is much better at conserving water than an older toilet would be. This toilet features a standard 12 inch rough-in, so it will be compatible with most homes. The surface of the ceramic is coated in an EverClean finish, which serves as a barrier on the ceramic that is designed to prevent odors and residue from creating bacteria that can seep into the ceramic material. IT is also a great way to prevent mold and mildew from forming on the toilet bowl, which can be a health concern if it is allowed to continue to grow. This unit is available for purchase in white, and it comes with a one year warranty from the manufacturer. 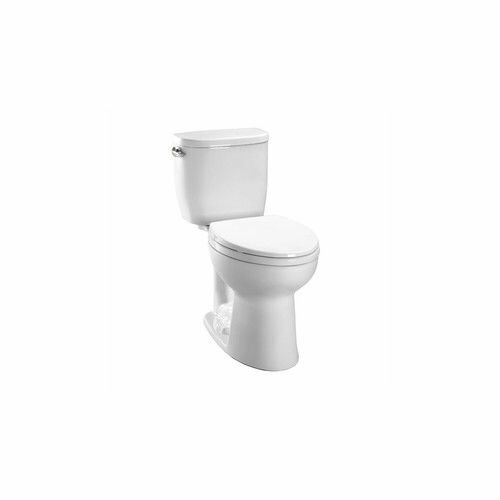 The Kohler Kelston toilet is a two piece toilet that we have selected as our bronze pick. This toilet is about 120 pounds, so it may be a bit more difficult to install without a professional. It features an elongated bowl that has a rim that is 16.5 inches in height. When you add a seat on to that, which is not included with the packaging, you will add an additional inch of height. Since this makes the toilet a few inches higher than the standard toilet, it complies with the ADA standards that makes it a suitable selection for individuals who have disabilities or trouble getting around. This model utilizes a standard 12 inch rough-in, which means that it should fit into most bathrooms with ease. This toilet uses single flush technology that is gravity assisted to create a powerful siphon to dispose of the waste in the bowl. 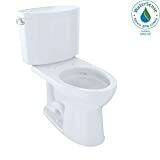 It is also designed with aqua pistons that are incorporated into the toilet to allow the water entering the bowl to flow from all sides, which creates a more powerful and effective flush. Each flush only uses 1.6 gallons of water, which is a relatively low amount, especially when compared to older models. The Kelston is available in black as well as six different tints of white, which are almond, biscuit, white, dune, sand bar, and ice grey. All of these color options can be considered white, but they do have slight colors incorporated into the paint that you will be able to see more clearly in good light. 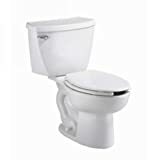 In addition, purchasing this toilet means that you will also receive a one year warranty that the manufacturer provides to stand behind the quality of the toilet. If anything happens to the product within the first 12 months of ownership, the cost will be covered. Everyone needs to use the bathroom facilities more than once in an average day, so you need to have an option available to you in the event that something happens to the toilet that is currently in your home, even if you are working on a tight budget. Our fourth pick, which is the Toto Entrada, is a durable two piece toilet that has a lot of the features you want in a toilet at a price point that is more budget friendly. Since this toilet is designed in two pieces, it is easy to install, especially since it only weighs about 64 pounds. It features an elongated bowl that can be fitted with any elongated seat, but you will notice that a seat is not included in the packaging of this unit. The rough-in is 12 inches in length, which is the standard distance for many of the toilet designs available on the market. It also features a standard chair height design that is comfortable for most individuals. The Entrada utilizes a traditional gravity flushing system that features an extra large siphon jet to help remove waste with ease. The E-Max system allows you to use this gravity assisted system while limiting the amount of water that is being used each time you flush; in fact, this toilet only uses 1.28 gallons of water per flush, which is one of the lowest water consumption rates available. In addition, the flush is really quiet on this model. This unit is available in two color variations, which are white cotton and off-white sedona beige. If you decide to purchase the Entrada, you will also receive a one year warranty with the packaging. Even though this is our ballin’ on a budget pick, the reviews for this commode are incredibly positive; in fact, 90 percent of all of them that have been posted as of this review have rated the product with a four or a five star rating. If you are in the market for a new toilet, one of the first considerations that you should make is whether you want a one piece toilet or a two piece one. One piece varieties are often more compact, which means that they can be a great space saver in a smaller bathroom. In some situations, they can even be installed under a vanity when floor space is at a premium. On the other hand, a toilet that features a two piece design is going to be larger, but easier to install than a one piece commode. The bowl of the toilet can come in a few different shapes and sizes. The most common styles are rounded and elongated. A rounded bowl is great for smaller spaces, as the front does not jut out as far. This is a great option for smaller individuals and children who are just learning to go to the potty to use. The elongated version is more comfortable for adults to use, allowing you to use the facilities without feeling cramped. These models are typically about five centimeters longer than the rounded variation. 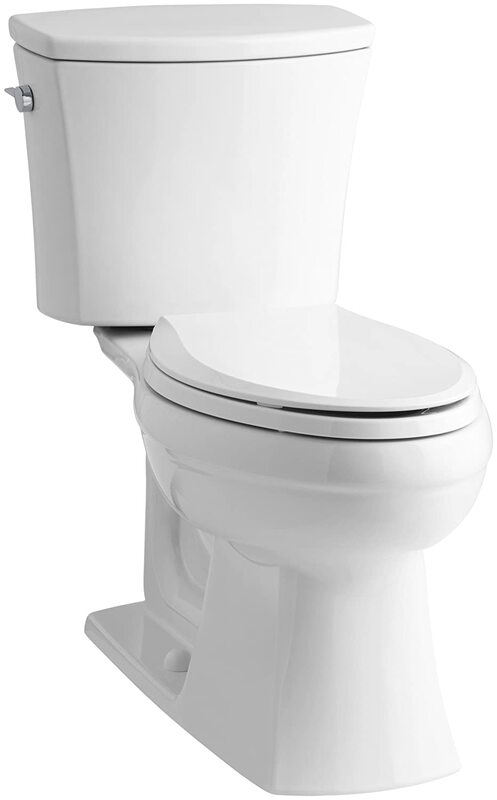 A standard toilet is about 14 to 15 inches tall, which is a great size for a child and most adult individuals. There are also comfort height toilets that are a little higher and easier to sit on for someone who may find it difficult to use a standard toilet. These models are two to four inches taller, which makes them the perfect solution for an elderly individual or someone with disabilities to use. Which height is the best option for the members of your family? Another consideration that you need to think about before purchasing a toilet is the rough-in size, which measures the distance between the wall behind the toilet and the outlet pipe. Toilets are designed to accommodate different sized rough-ins, so it is important to know what you need in your home. Most measure 12 inches, but they are also available in ten inches, 14 inches, and they can be customized to fit your bathroom needs in necessary. Toilets have different flushing technology that you will want to consider when purchasing a toilet. Which method do you prefer? Here is a breakdown of the different ways that a toilet can flush and some of the pros and cons of each. • Gravity Assisted – This is a basic flush style that relies on gravity to create a siphon action to empty the toilet bowl. This is the most common style used in North America. It is a simple, durable option that flushes without a lot of noise, and it is easy to repair. • Pressure Assisted – This flush style utilizes a sealed internal tank that builds up pressure between uses. When a flush occurs the pressure is released with a loud whoosh that is very effective at cleaning the waste from the bowl. This can cause stress on your pipe structure, so this may not be an ideal option for an older home. • Vacuum Assisted – Vacuum assisted toilets use a flush system that is similar to a gravity assist, but the siphon is created from a vacuum. This system is very quiet, but it tends to cost more money; however, unclogging them and cleaning them may take more effort than you wish to spend. • Power Assisted – Power assisted toilets are a great way to save about 2,000 gallons of water a year. These types use a motor to basically send a blast of water into the bowl when you flush. They are extremely loud and expensive, and the pump does need to be plugged into an electrical outlet to function, so it may not be the best option for some homes. • High Efficiency – These toilets are great for water conservation. They provide a powerful flush with less water than most other flushing technologies. These toilets use less than 1.28 gallons of water per flush. • Dual Flush – This type of flush allows you to choose how much water is used when you flush. If you are only flushing liquid waste, then you can do a half flush that only uses between 0.8 and 1.2 gallons of water per flush. If the waste is solid, then use a full flush. A full flush still only uses 1.6 gallons of water per flush, which is still less than most other options. Toilets that are manufactured today use a lot less water than they have in the past, but there are still things you can do to save additional water. A high efficiency toilet or a dual flush system are both great ways to decrease your water usage. A high efficiency option that uses 1.28 gallons of water per flush will save about 44,000 gallons of water over the lifetime of the toilet. A comfortable toilet seat is important, but some offer more padding than others, some offer heated seats, and some are removable to make cleaning them easier. You can even find bidet style seat accommodations that offer dual jets for cleaning your front and backside, pre-heated water options, air drying, and glow in the dark features to make nightly trips to the bathroom more convenient. Make sure to consider these extras before settling on a traditional toilet. A toilet can cost you anywhere from $100 to over $7,000, depending on the design and the features that you choose. Make sure that you know your budget before you decide on a toilet that you really cannot afford to purchase. Don’t forget to include the cost of installation in the cost of the toilet, unless you are handy enough to properly install it on your own. In addition, make sure that the toilet comes with a warranty. You are looking for a durable commode that will last you for years, so it is important to find one that is backed by the manufacture. Over 30 percent of the water that is used in each home is used in the toilet, so it is important to find a model that can save water and energy without sacrificing flushing power. You will want to find a toilet that actually flushes down the waste in the bowl instead of leaving a trail behind. If you are in the market for a new toilet, then consider the picks that we have examined in this list. If you are looking for a feature that we have not covered with these options, then start taking the steps required to finding a toilet that fits the needs of your bathroom. A little due diligence will help you find a toilet that you will find comfort in for a decade or two; where as simply purchasing the cheapest one may be regretted later. You will be using this toilet a few times a day for 20 years or more, so do your backside a favor and find a comfortable commode that will not be a pain in your rear end.